Last Friday I was driving to Alemany Farm to volunteer there, mostly to harvest produce for the Free Farm Stand on Sunday. I was feeling pretty good, the sun was out, the greenhouse at the All in Common Garden was almost done, and I had started looking at what seeds I saved since the Free Farm closed last year. It was like visiting old friends, opening up what was left of my seed collection, having given away almost all the seed from that wonderful project. I got excited thinking about what I might like to plant in the new digs. A song from the sixties came on the radio and I recognized it, me being an old hippie, but I couldn’t think of the name of the band. At that moment I started getting nostalgic for that summer of love and thought I should go home and vape and chill out, forget going to the farm and laboring outdoors. I chose to do the right thing and harvest vegetables. 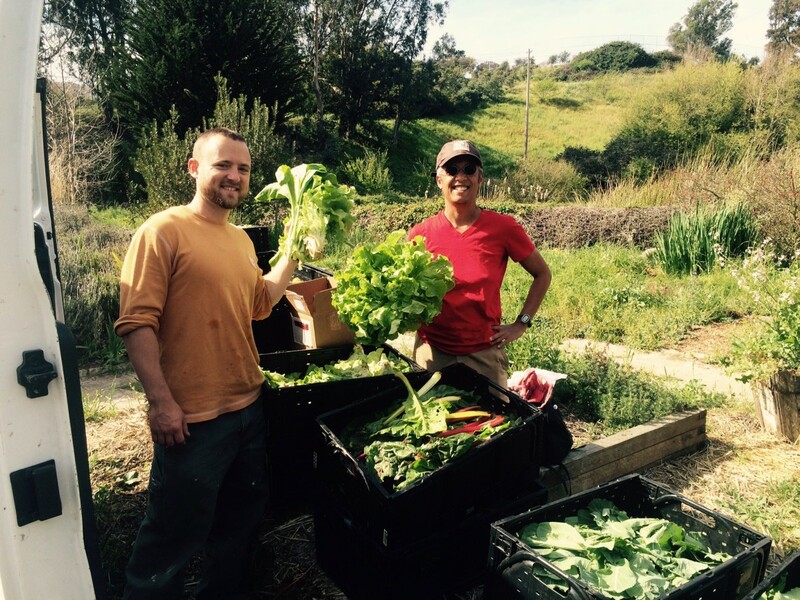 I am glad I did, we brought home 256 pounds of veggies, mostly greens…like chard, kale, Asian mustard greens, lettuce, and cabbage. It is the season of harvesting! We also scored a lot of seedlings to give away at the stand and to plant (we gave all the seedlings away on Sunday, they were very popular). 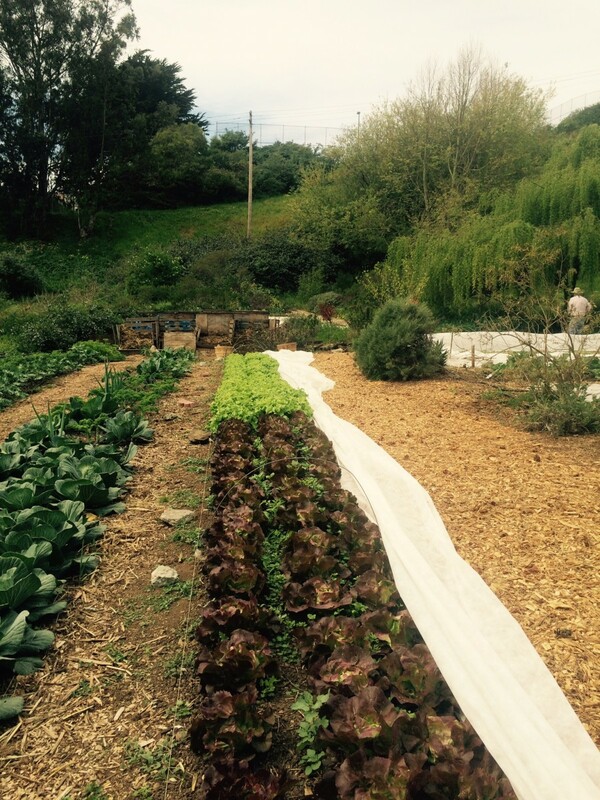 Spending a few hours harvesting vegetables and fruit is an excellent way to tap into an appreciation of where your food comes from and I highly recommend it like a yoga practice. It is a way of connecting to the divine. Join me some Friday at noon until 3 or 4pm to help us harvest and see what it is like. Also, Alemany Farm is an interesting place to visit, a mixture of farm and wildlife next to a noisy freeway and the projects. 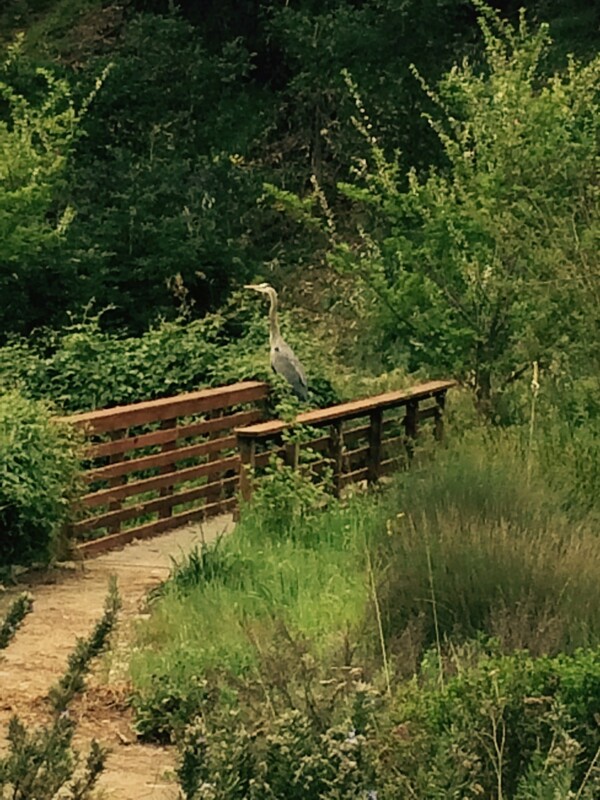 It turned out that the other day I was in the All in Common Garden and we had a visitor named Miles. We were talking about the 60’s and he used to work at the radio station KSAN FM which was a pretty famous rock station at that time. He knew the name of the band for the song that was stuck in my head (the Zombies). That is why I love the work I do both at the Stand and in the Garden, I meet so many interesting and beautiful people. And then talking about getting high I read the most remarkable article in the New York Times the other day: Can Washington’s Gift Economy in Marijuana Work? “…In Washington, D.C., it’s now legal to possess marijuana, to grow it, to smoke it and to give it away. But you’re not allowed to trade in it. You can give your neighbor up to an ounce, but if he gives you money or even bakes you a pie in exchange, that’s illegal. Some of us dreamers have been advocating for a Free system for everything forever. If the Rand Corporation is coming up with this idea you know the times they are changing. Here is another thought about the hand of the almighty touching us. I have been working hard with so many different volunteers finishing building the greenhouse. The last thing I have been working on is installing a sink. When I was home I decided to open a young coconut that had been sitting in our refrigerator for about a month. I cracked off the top and poured the most delicious water into a glass. I thought nature has us beat when it comes to supplying me with a cup of water that I don’t need plumbing for. How wonderful and precious is that miracle of the coconut and those miracles are around us everywhere. In these difficult and sad times we are in, these things cheer me up and are my source for hope. More than ever we must continue to focus on the divine and the mysterious and the glorious workings of the universe. 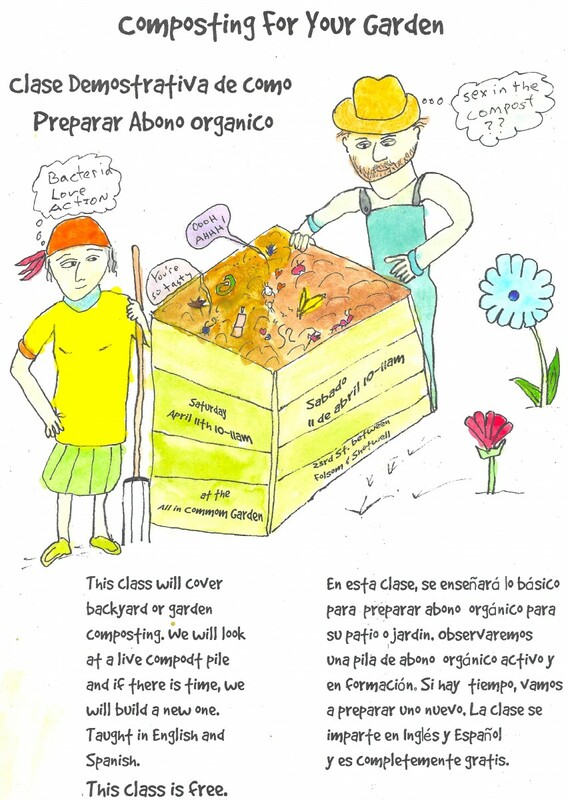 Below is a poster for a workshop we are having at the All in Common Garden about composting Saturday April 11th. We will explore the magic of soil and compost and show you how to make some of your own of this good stuff. 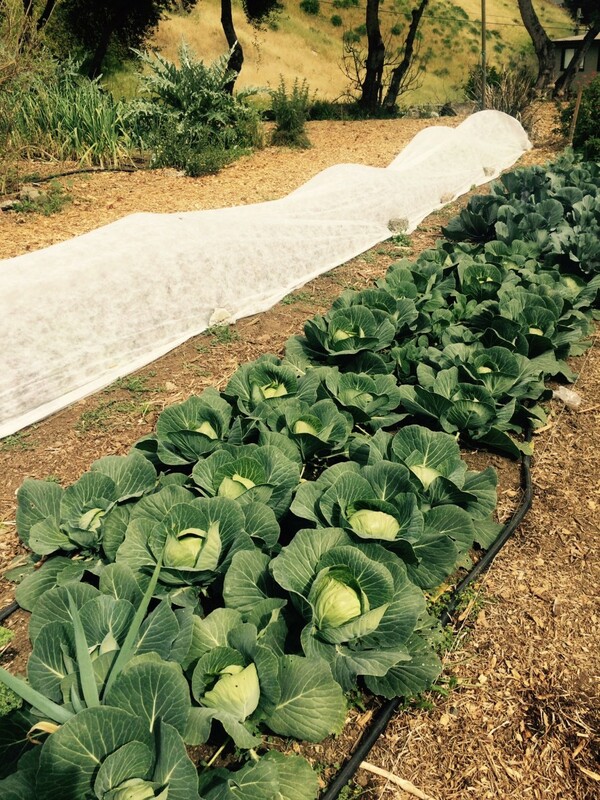 We continue to need volunteers both at the Free Farm Stand on Sundays starting at noon and at the All in Common Garden (mainly on Saturday 9am until 3pm and Tuesdays 1-3pm). It is a fun way to meet people and learn about growing flowers and food and giving it away in a beautiful fashion. H Tree – still really enjoying receiving posts from you. live in. Lifts me up!